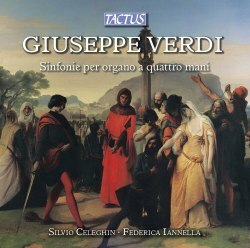 Although it was reasonable to hope for some unusual and interesting recordings emerging for the Verdi anniversary year, this is by some way the most unexpected and enjoyable that I have come across. The arrangements used are based on standard piano duet versions but adapted by the players to make full use of all the resources available to them to imitate the effect of the orchestral originals. Those resources are indeed much greater than the listener more used to the English Cathedral organ might expect. As well as stops whose primary colours have a cheerful vulgarity closer to fairground organs this splendid organ dating from 1825 by the Serassi brothers has two drum (Timballi) stops. As a result the two players manage to produce some extraordinary sounds, often, but by no means always, getting much closer to the character of the original music than one might have thought possible on the organ. They take turns as to who plays which part, but such is their ensemble that the listener is never uncomfortably aware that two players are involved. Both play with great rhythmic panache and phrase with real affection for the music. Not everything is perfect or works well on the organ, even on this extraordinary example of the instrument. Curiously the March from Aida is particularly ineffectual, the trumpet stop producing at best a pale imitation of the effect of the original instruments. “Va pensiero” is another casualty, with the organ unable to imitate the kind of vocal fervour with which any decent chorus can make an immense effect. The Overtures on the other hand all work extremely well, and I have returned to them with great pleasure. Perhaps this pleasure does not always derive from the effect that the composer might have intended, and at times it does indeed seem almost a guilty pleasure. At the most noisy moments I was even reminded of descriptions by Revd. Haweis in the popular Victorian book “Music and Morals” of the evil effect of street organs, but the sound always had a real fascination. The disc comes with a booklet with helpful notes and the full specification of the organ, and is recorded clearly, at times perhaps too much so for comfort. Obviously no one is likely to buy this disc as an alternative to the original versions. It is a wonderful if slightly weird supplement to the originals and is likely to appeal to all Verdians or organ lovers with a sense of adventure.